In September 1967, Miss J.C. Olive was informed that she had been appointed as Principal to open the Dunvegan Primary School in January 1968. On 2nd January 1968, the Transvaal Education Department moved in contractors and furniture into the prefabricated site in Hurlyvale. On 15th January 1968, Miss Olive and ten teachers reported for duty and the following day, 280 pupils arrived. 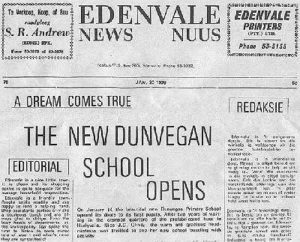 Dunvegan Primary School was up and running. 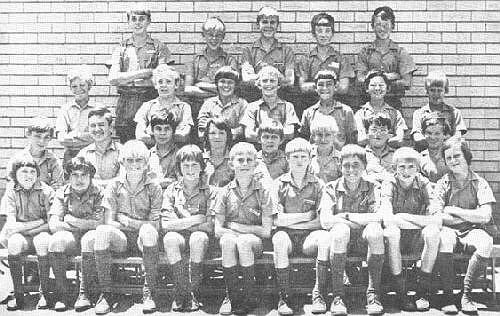 On 4th May 1968, the PTA held its first fundraiser – a braai and games evening – and raised R250.00. On 27th May 1968, the School Committee met to judge the School Badge Competition. The design chosen symbolised growth. In September 1968. the new school site was officially handed over to the contractor, Mr. Rudolph. 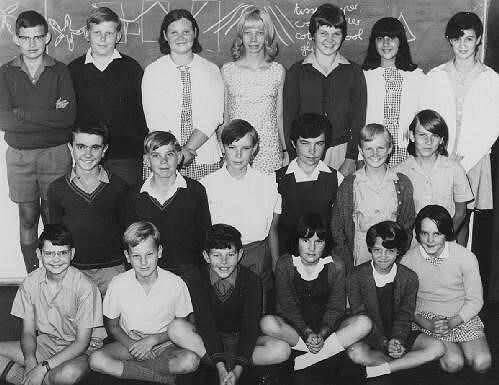 When the school reopened in 1969, the enrolment had risen to 485 and a teaching staff of 15. In November 1969, a “roof wetting” ceremony was held at the new school. On the 8th and 9th December 1969, the School Board assisted the school in moving into the new school premises. 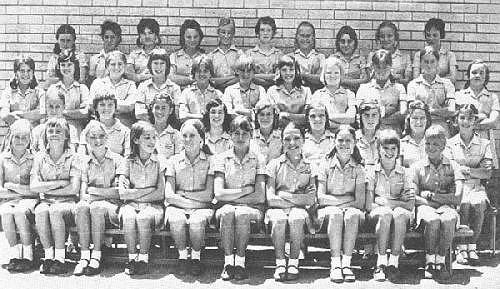 On 14th January 1970, the school opened on its present site with an enrolment of 678 pupils and 23 staff members. Building work was only fully completed by July 1970. On the 21st November 1970, the Director of Education in the Transvaal, Dr A.L. Kotzee, officially opened the school. A plaque commemorating this is to found at the entrance to the school’s reception area. In January 1981, the school received its second Principal, Mr. Derick Hull. School enrolment was 800 pupils and 33 teaching posts. In June that year, the School Hall was named after the first Principal, Miss Joyce Olive. In June 1991, Dunvegan Primary School became a “Model B” as voted on by parents (86.9% in favour) at that time. In 1992 the status of the school was changed to that of a “Model C” school. In July 1991, work began on Phase 1 of the new Media Centre, which would comprise of an auditorium and a Junior Primary Library. This facility was in use by January 1992. In September 1994, work began on Phase 2 which would house a Senior Primary Library, a Media classroom, a Teacher’s Room and a Computer Centre. In June 1995, computers were installed into the Computer Centre. The centre is known as The Betty McCreadie Media Centre, named after a past teacher who instrumental in developing a library at the school in the 1970’s and 80’s. In 1997, legislation classified Dunvegan Primary School as a State School (no longer a Model C School). In February 1997, Mr. Colin Johnson became the third Principal of Dunvegan Primary School following Mr. Hull’s retirement. In May 2000, the school began its own website. In June 2002, the old prefab classrooms were demolished and the building of a new classroom wing commenced. The new wing was completed in December 2002. It comprises of 4 classrooms, change rooms, a Tuckshop and a second computer centre. In the period 2008 to 2011, the original perimeter fencing was replaced with a brick and palisade wall. In July 2016, Mr. Colin Johnson retired. 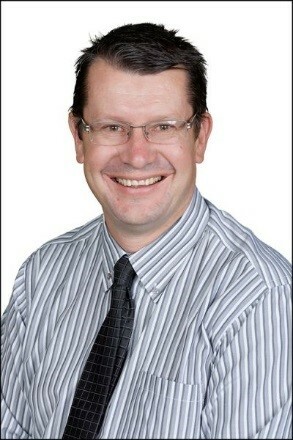 This vacancy was filled by the current Principal Mr. Richard Laidley. Small acorns may grow high. Back: Wayne Selkirk, Carlo Leusink, Charmaine Arundel, Mrs A.E. Lambert, Cheryl Nicholls, Sabrina Maio, Joan Eyers. Middle: Edwin Larkman, John Macvie, Garth Steward, Ruth Edwards, Jennifer Canning, Glenda Edwardes. Front: Peter Jackson, Bernard Rundle, Stephen Nicholas, Heather King, Beverley Montgomery, Edna Purcell. Absent: Colleen Bosch, Ian Marot. 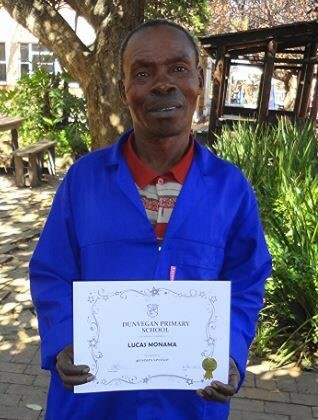 Mr. Lucas Monama – the longest serving staff member ever at Dunvegan Primary – just over 40 year’s service. He retired in June 2013. Miss Joyce Olive: January 1968 – December 1980. Mr. Derick Hull: January 1981 – February 1997. Mr. Colin Johnson March 1997 – July 2016. And that was the time when we had fun. I had a wonderful Grade 1 year. But we hadn’t quite mastered it then yet. That’s why we were able to go to Grade 2. We even had to learn cursive handwriting. And with Mrs. James as my teacher, I had a good time in the end. And here we had to write in cursive text. We had busy books, Maths and readers we read. And we wrote in blue pen, not pencil lead. Grade 3 to Grade 4 was a huge difference. We learnt new subjects like I.T. and N.S. We even changed classes and wrote cycle tests. But in my class you were never to fall. We went to Kidz Kamp, our very first tour. And being in her class was such a treat. We didn’t know that we had so much in store. To our second tour, Die Oog, Serolo. The heated pool with all the mist. And we would all have fun. For our final year was coming along. Was definitely the Bush Pigs tour. And what we should do to conserve it for the future. And enjoyed ourselves in every way. And the teachers had to join in, of course! Those things I dreaded even touching. “Afrika is nie ‘n plek vir sissies nie!” So I spat the dung instead! and we were so thrilled to represent Dunvegan. And now I think we’re ready for grade 8. Our junior grades and senior ones too. They’ve been like parents in a second home. And it’s time to say goodbye to old friends. I had a special seven year family!